To summarize, I-79 to the Clendenin exit, 4 East to Clay, 16 South to Rt 60 East to Fayetteville, and 19 North to New River Gorge and Summerville. Following Rt 19 North further will eventually bring you back to I-79 closer to Clarksburg. The rest of Rt 19 is also beautiful, but 19 is a 4-laner....not that there's anything wrong with that. We jumped off of I-79 at the Clendenin exit to grab a pizza in that small town about 3 miles down the road. After eating, we checked the map to see how we should go about getting to the New River Gorge. Rather than taking I-79 to Charleston and then cutting across the state on Route 60, I noticed that we could take Route 4 East to Clay and then take Route 16 South to Route 60. That would bring us out on Route 60 close to Route 19 North where we wanted to be. It looked like we would at least be off the highway for a while and it looked like a shortcut. Well, we never ran into a traffic light again until the intersection of Route 60 and Route 19, about 75 miles later. What a beautiful route we lucked into. The road looks like it must have been cut out of the mountains/hills, with flattened rock edges pretty much down the entire left side of the road on Rt 4 and 16. On the other side of the road were trees, with scattered homes along the river. This section follows the Elk River on the right side of the road. When you hit Rt 60 East, the real adventure starts. One of the curviest roads I've ever been on, winding it's way up the mountain and back down the other side. Along the way, on the right side were an abundance of waterfalls and the views of the drop off on the right side of the mountain were incredible. We stopped at a gas station just before going up Gauley Mountain, and we spotted a family of river otters in the river there. Important, while on 60, follow the 60 to Fayetteville to the traffic light, and then head north on Route 19. In 25 to 30 miles, you will find ample lodging in Summersville, equipped with a Wal-Mart and all other amenities. Nice, smooth, and curvy roads with occasional flat straight stretches with no good police hiding places for you to end up with a ticket. Like I said above, the short stretch on Rt 60 is one of the curviest roads I've ever ridden. There are gas stations approximately every 9 to 11 miles, but not much else. I believe there were 2 very small towns to pass through, one of which is actually at the start of the journey. Summersville has plenty of restaurants and places to gas up. on August 23, 2009 1 out of 1 members found this review useful. 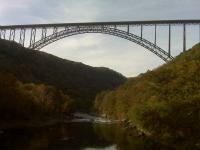 I came into New River Gorge from farther west on 19 North / South just off of the North Beckley exit at Exit 48. It is an amazing place to stop and smell the roses. you can stay at a local campgrond called Riftrafters for only $18 bucks a night in a cabin and that was the best deal I found inthe area. Tons of coal mines , and whitewater rafting all over the surrounding area. If you haven't been to the gorge yet it is one of themust see destinations in the US. We just ran from Clendenin to New River Bridge by way of Lizemore Rd (thru Bomont/Glen). Lizemore Rd is not for the faint of heart. Narrow hollow road, no guard rails, good pavement with many, many short, tight turns. Hwy 16 down to Gauley Bridge today has many longitudinal (sp) cut/patch repairs and sections of washboard. Can be a beautiful ride if you take the time to 'smell the roses'. We just got back from this ride. It was wonderful! Scenery was amazing. Very curvy but roads are nice and wide and easy to take turns. Summersville had adequate lodging and places to eat. We ended up getting some rain in evening so we went to a movie there is Summersville. Lots of little places and waterfalls to pull off and enjoy the scenery on our way to the Gorge bridge.